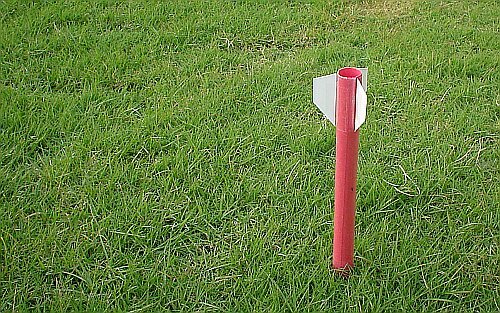 I first saw paper rockets launched at a church-sponsored campout in the Tonto National Forest in Arizona. Steven Lees had brought his launcher and got all of the kids making their own paper rockets out of construction paper, clear plastic shipping tape, and a few paper plates. I was truly impressed. 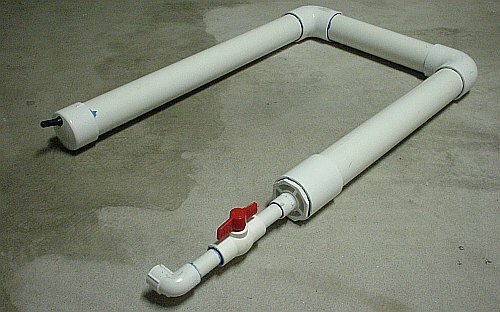 I love this kind of stuff, and once I understood how the system worked, I couldn't wait to get back to Home Depot and start buying PVC. I did a bit of preliminary research on the web and whipped up a quick 3D model (using NX) for sizing and layout purposes. Then, after a quick trip to Home Depot and Auto Zone, I was ready to start! Here are a couple of short video clips showing the launcher in action and fun reactions from kids in the neighborhood. Getting the valve to work is a rather critical part of this project, and because the valve must be installed from the *inside* of the pressure chamber, you *must* do this step first. 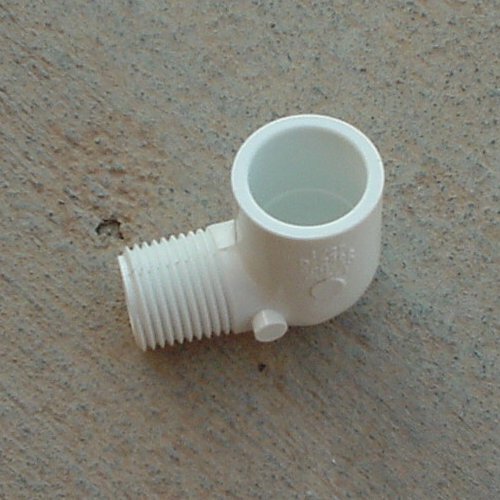 1 Start by making a hole in the 2" cap to receive the valve stem. 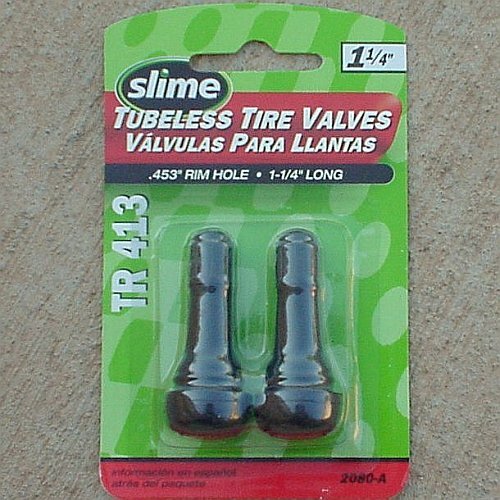 The Tubeless Tire Valve has a relatively soft rubber body that is designed to be pulled tight through a 0.453" diameter mounting hole. 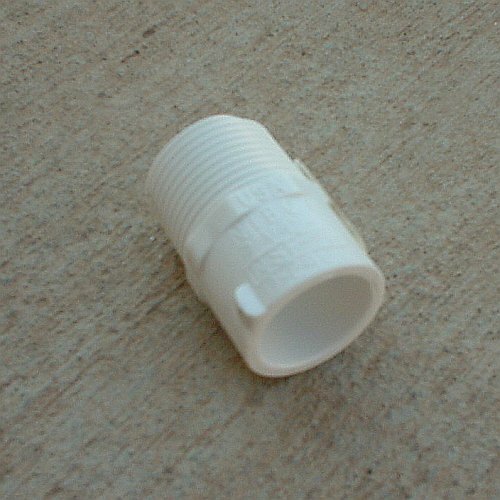 2 Once the hole is perfect, insert the valve stem from the inside of the cap and pull it outward until it snaps tightly into place as shown. 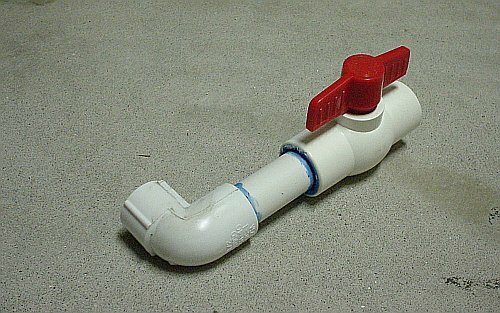 The key to success here will be getting the hole very round (easier with the right drill bit, of course) and just the right size to engage the stem snap tightly, thus allowing the shoulder of the valve stem assembly to engage with the PVC all the way around and maintain pressure with a tight seal. 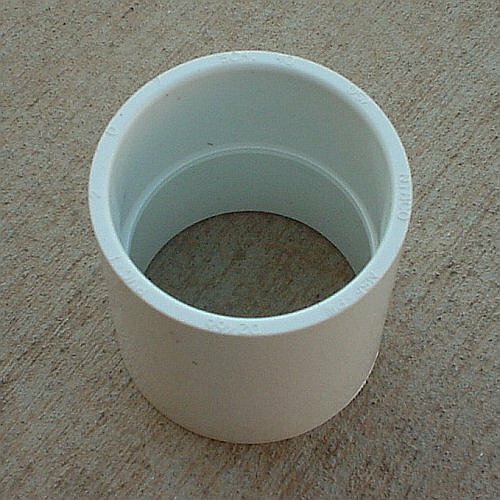 The bulk of the pressure chamber is constructed using the 2" PVC, making a U-shaped chamber for stability when sitting on the ground. 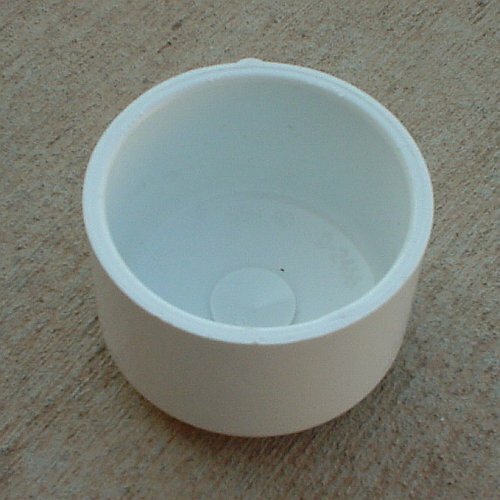 The 2" Cap (with the protruding valve stem) will be one end of this chamber, and the Ball Valve assembly will screw into the other end. The three 2" diameter sections should lay flat when assembled, so take care to keep the reservoir assembly pressed flat against something like a garage floor while gluing the segments together. 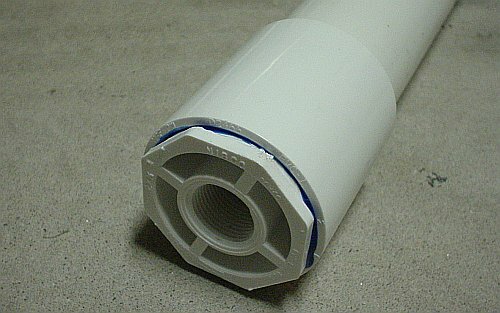 3 Attach the cap to a 24" piece of 2" pipe. Again, make sure the Tubeless Tire Valve Stem is already installed -- it's going to be kinda impossible to install it later. 6 ...and another elbow, an 18" piece, and the straight 2" coupling. 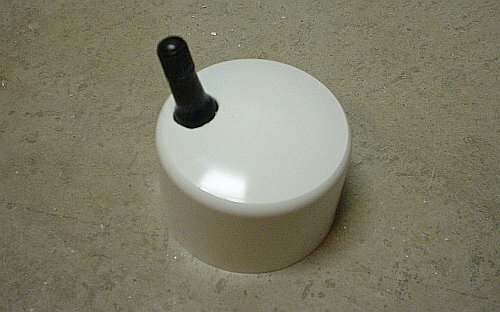 7 Then cap this main portion of the reservoir body using the Flush Bushing. 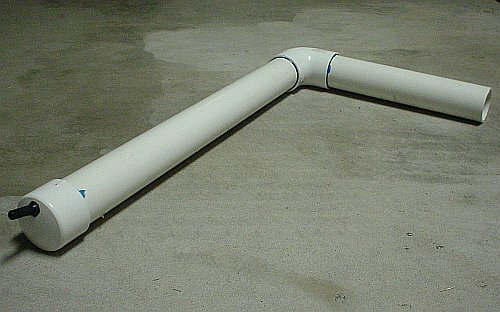 8 First, glue one three-inch segment of 1/2" pipe into the solvent end of the Straight Coupling. 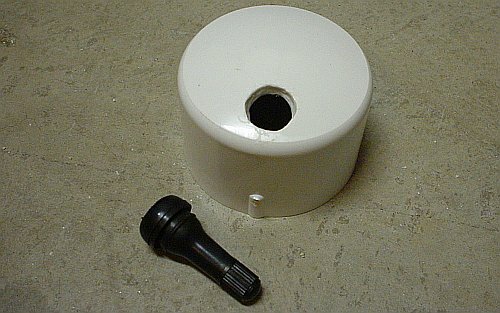 Then (adding a little bit of silicone tape to maintain a tight seal) screw it into the Flush Bushing. 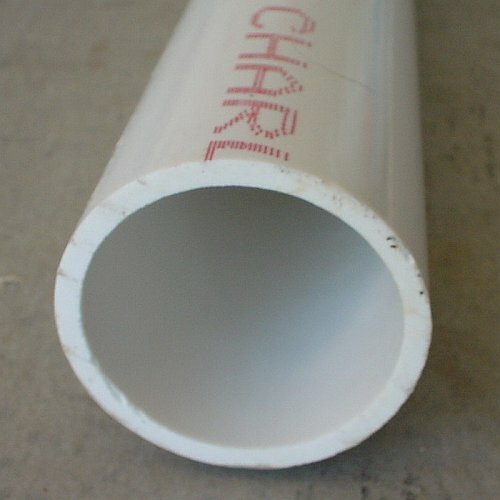 Note that because this joint is a critical part of the pressure chamber, it must be airtight. 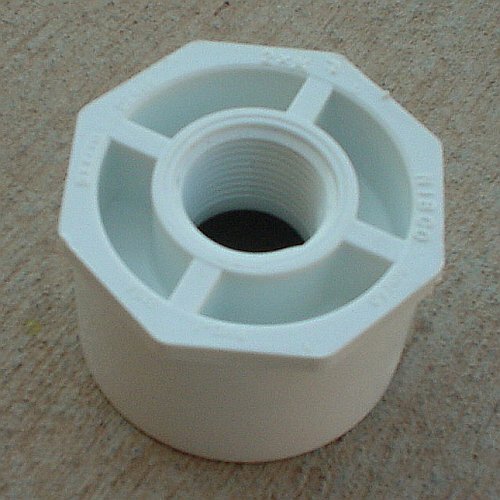 The straight coupling has flats for a wrench -- you'll definitely want to use them to tighten this joint. Assembling just this first segment will allow you to glue the Ball Valve onto this segment in the desired orientation -- if the Ball Valve were already glued to this segment before you screw it in, then it would be very difficult to get the orientation correct while establishing a tight seal with the Flush Bushing. 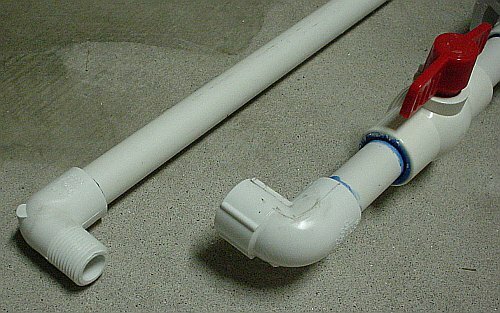 9 Next, assemble the Ball Valve, another 3" segment of 1/2" pipe, and the first small elbow (female solvent on one end, female thread on the other) as shown. 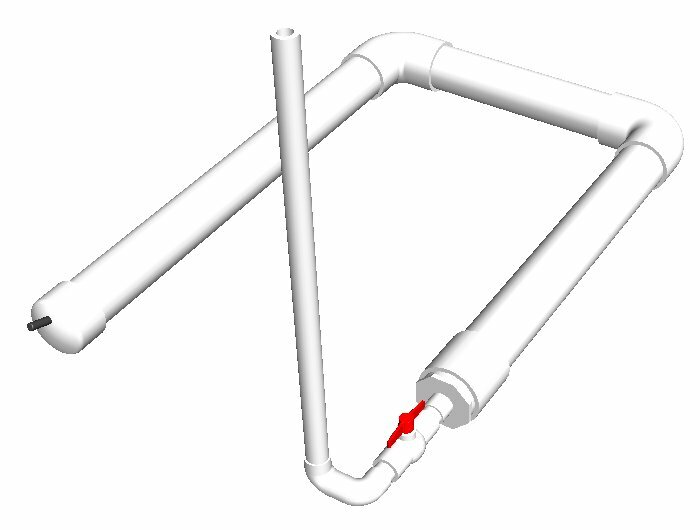 Again, *my* preference was to have the Ball Valve handle pointing UPWARD and the launch tube pivoting around an axis parallel to the ground (a pure "elevation" control), so establishing the correct angle between these two components was rather important. 10 Next, glue this small subassembly to the chamber assembly. Again, be careful to maintain the desired orientation during this step. 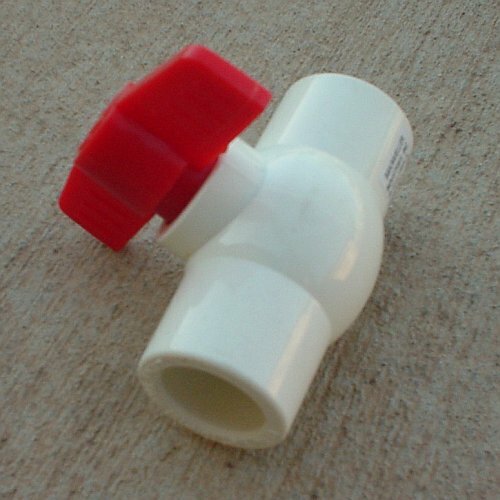 11 Once the Ball Valve has been attached, you should now have an airtight pressure chamber. 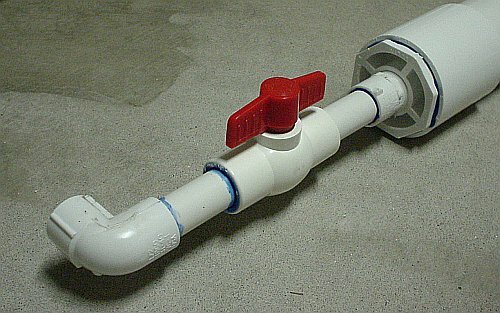 This is a good time to test your chamber by closing the valve and pumping it up a bit. Personally, I use a small portable battery-powered air compressor with an integral pressure gauge. 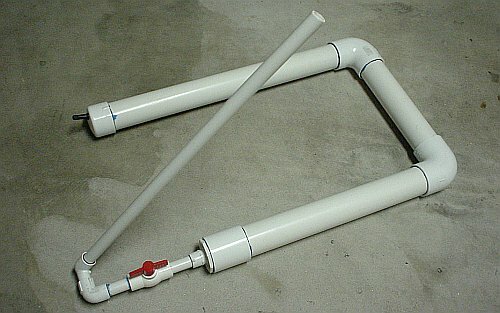 Many manual bicycle pumps similarly have a pressure gauge as well. Test the chamber by running the pressure up to about 20 psi. With the pump power off, listen for any hissing noise indicating leaking air, and watch the pressure gauge needle to see if any pressure drop is evident. If you're not hearing any leakage and the pressure holds steady, then you're in good shape! The final step is the launch tube -- the segment over which your rocket will slide when you launch it. 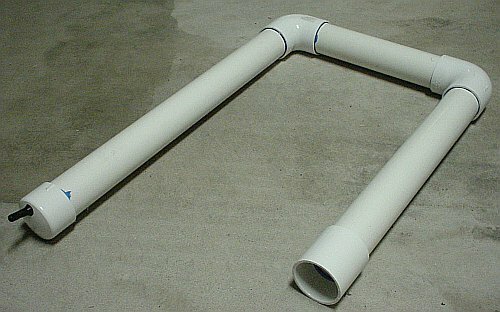 12 First, cut the launch tube to the desired length -- I made mine 24" long so that it could stow flat inside the U-shape of the pressure chamber. 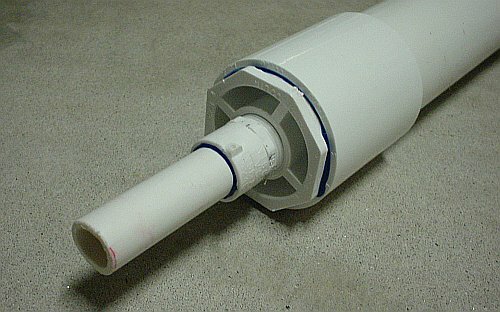 Then, glue the second elbow (female solvent on one end and male thread on the other end) onto one end of the launch tube. You may want to slightly taper the other end of the launch tube to make it slightly easier to slide the rockets onto the tube before launching. 13 Finally, screw this launch tube assembly into the pressure chamber assembly. It should be loose enough that it can be easily pivoted but tight enough to withstand the blast of compressed air. The "air-tightness" of this joint is less critical as it is not *maintaining* pressure -- just guiding the blast of compressed air for a fraction of a second. 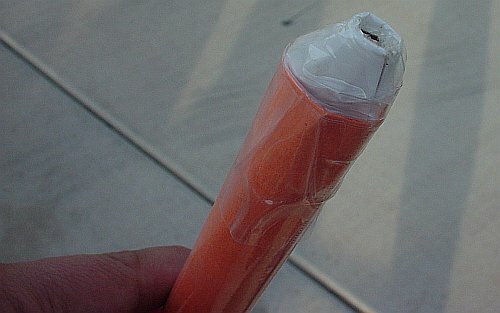 A simple rocket can be constructed using a sheet of construction paper, sheet of cardstock (or a stiff paper plate), and some clear packing tape, as described here. 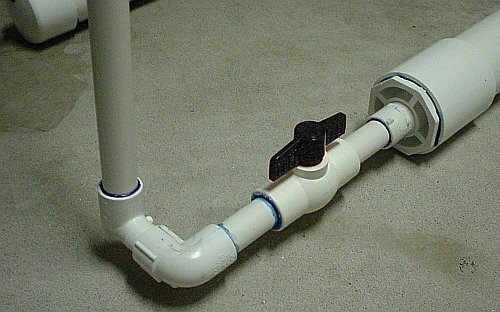 14 Roll the sheet of construction paper around a segment of 1/2" PVC pipe to get the size right. After rolling it fairly tight, relax the spiral just a bit so that the tube can slide smoothly over the outside of the launch tube. 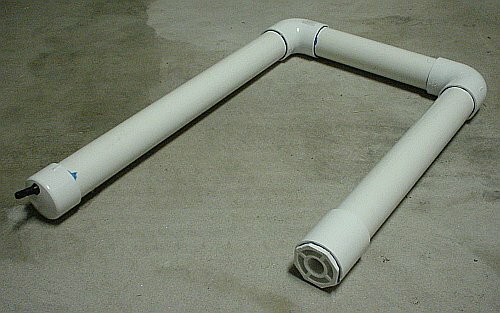 Then, use the packing tape to secure the tube together. 15 Make a nose cone by forming a half-circle of the cardstock (or stiff paper plate) into a conical shape. 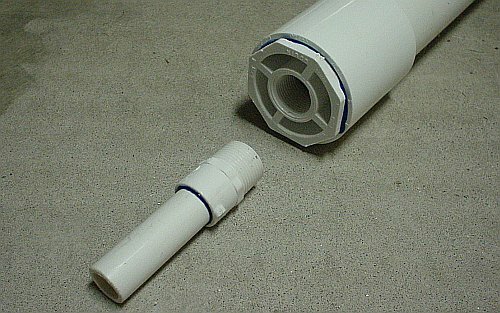 Trim it up to fit the size of your rocket, and *SECURELY* tape it on to one end of your tube. Note that when you open the valve and blast your rocket with compressed air, this nose cone will take the brunt of the force, so make it quite strong and attach it securely. Don't skimp on the tape. :-) The extra mass in the nose will help the flight characteristics a bit as well. It goes without saying that the landing can be pretty brutal on the nose cone, too. This picture shows a rather flimsy nose (one thickness of stiff paper plate material) after about three landings in the street. A newer design with about three thicknesses of the same heavy paper plate material barely dented when it hit the same street repeatedly. Sturdy nose cones are good. 16 Finally, cut some tail fins from your cardstock (or paper plate) and tape them onto the other end of the tube. You can experiment with different shapes and orientations to achieve different flying effects. Prepare to have a *lot* of fun. Children and adults alike are drawn to this little unit, and if everything goes right, you're going to see a lot of smiling and giggling and clapping and general excitement. Just be safe! Be careful about launching rockets into or toward streets. While the rockets will not do significant damage to a car, children have a tendency to chase the rockets while looking up at them in the sky, and moving cars can do a lot of damage to a child who is running into the street without watching for traffic. Slide a rocket down over the launch tube. It should slide smoothly so that it can release easily. 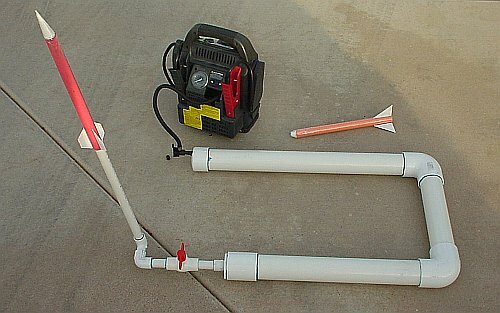 18 Close the Ball Valve, attach your pump, and pressurize the launcher. For reference, my initial launches at about 25 psi [1.7 bar] were sending the rocket about 80 feet [25 meters] into the air (total flight time of about 4.7 seconds -- just like a really good football punt). One subsequent (almost vertical) flight at 35 psi had a total flight time of over seven seconds -- indicating (neglecting air friction) a peak height of close to 200 feet. It gets hard to see these little rockets at that altitude! 19 After the obligatory countdown ("Five... four... three... two... one... Blastoff!") quickly open the Ball Valve. Then, watch the rocket soar and listen to the awestruck crowd! NOTE: The rockets hit the ground with a fair amount of force. This one landed in the grass and embedded itself about five inches into the turf. Don't let kids try to catch these things -- they're sharp and tough and moving awfully fast. 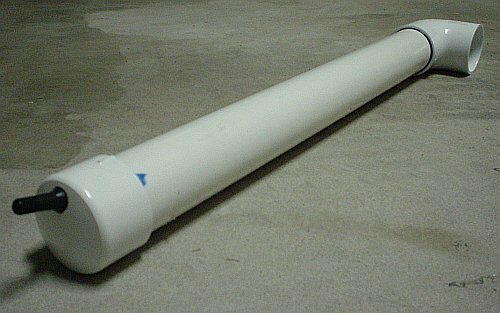 First, the main tube (light cardboard) of her particular rocket was almost *exactly* the right size to slide smoothly over the outside of my 1/2" PVC launching tube. Third, the tail fins were a single-piece injection-molded plastic unit that just slid on the back of the tube. Hmmm.... 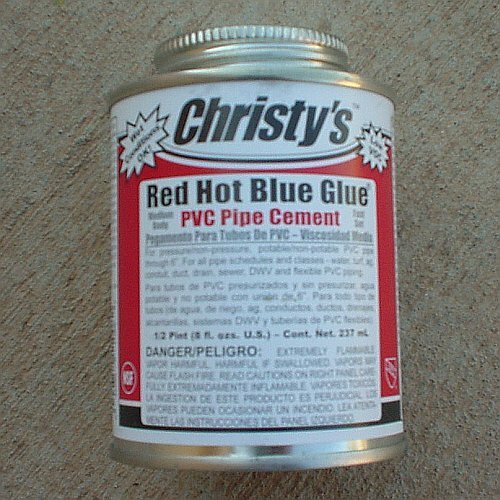 I'm gonna have to run down to the local hobby store and check out some of these materials for my next generation of rockets. I wonder a little about the maximum safe operating pressure of this unit. 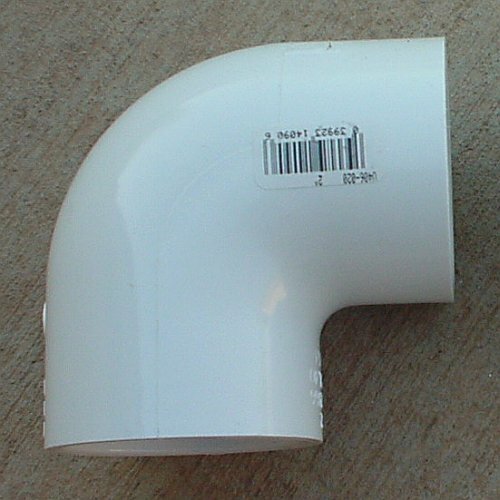 All of the PVC components were rated for at least 150psi (and some for as much as 600psi), but in the case of pressure vessels, averages don't matter at all. I think the "weakest link" in this pressure vessel is the initial one -- the Tubeless Tire Valve Stem through which the launcher gets pressurized. The packaging for the valve stem does not specify a maximum pressure rating, but seeing as how the average operating pressure of normal car tires (for which people might realistically be buying replacement stems at Auto Zone) is between about 25 and 40 psi, I'm thinking that *my* safe operating range for this unit might be limited to that same range. I would expect that a very reasonable safety factor has been built into the valve stems to accommodate higher transient (shock) pressure loads due to things like potholes and rocks. You don't often (ever?) hear about a car hitting a pothole and having a valve stem pop loose from a wheel. At much higher pressures, though, I could certainly envision the rubber valve stem being forced outward through my imperfect mounting hole. If anyone has any better specs on the pressure limits of a Tubeless Tire Valve Stem, I'd love to know about them. In the meantime, 20-30 psi shoots rockets *very* well. A small pressure gauge that I can build into the unit for an additional pressure measurement point. The first little 12-volt compressor I owned (may it rest in peace) had an integrated pressure gauge as well, but my confidence in the gauge reading dropped as the unit got older. 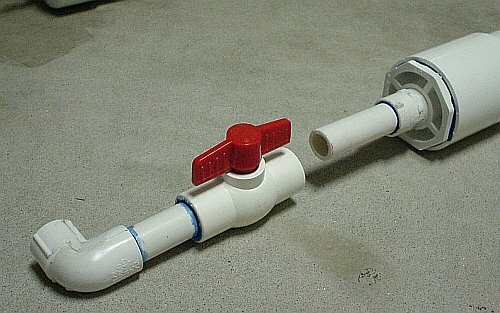 A small pressure relief valve that I could set to some desired maximum pressure. This just seems like a smart idea, safety-wise. The above design is based on a blending of a design originally at Steve Spangler's site and my good friend Steven Lees' version.